Risking their own lives to save others and helping the community is what firefighters do on a daily basis. But witnessing the tragedies and emergencies can also lead to frustration and even despair. “I used to be a vulnerable person with a bad temper. 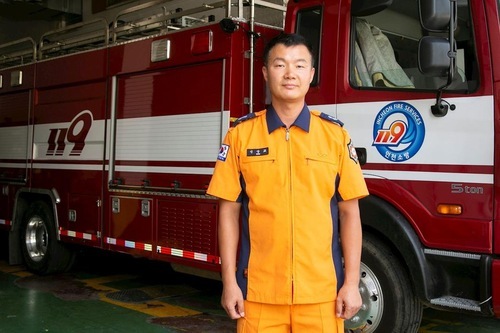 It is Falun Dafa that gives me confidence, courage, and a happy life,” explained Xin Xiangjiao, chief of a 119 fire department in Incheon, South Korea. Xin, 44, said the changes occurred 15 years ago. At that time, he had graduated from college and was working as a tutor, while preparing for an exam to become a government officer. One day, he saw a pamphlet on Falun Dafa near the home of the student he was tutoring. “What was described in the pamphlet really inspired me,” Xin recalled, “The principles of Truthfulness-Compassion-Forbearance, the five gentle exercises, and the significant health benefits—everything was so exciting.” The daily work and preparation for the exam frustrated him, prompting him to search for something that could help him solve these problems. Falun Dafa was what he had been waiting for. Xin continued, “It is like an oasis in a desert, providing me with assurance both physically and spiritually. I was thus able to cope with difficulties that I came across in life.” Before then, he forced himself to study in the library every day for the exam, despite the frustration, distraction, and having a muddled mind. The practice of Falun Dafa and reading the book Zhuan Falun, in contrast, filled him with energy and peace. Gradually, he became more relaxed and focused. His efficiency and memory also increased significantly. Before that, he applied to become a patent attorney but failed the test several years in a row. “The exam I just took was also difficult, and I am surprised that I passed it after so little preparation,” he added. Falun Dafa books keeps Xin in a positive frame of mind. Quite a few people that Xin knew had tried to stop smoking or drinking, which usually failed miserably. Like them, Xin was addicted to smoking and alcohol. Merely a month after beginning to practice Falun Dafa, he miraculously succeeded in quitting both of them. People he knew were surprised to hear that he no longer smoked and some said he must be very tough on himself to achieve that. “To me, it wasn’t difficult at all. You know what you should and should not do, and the changes followed naturally,” he explained. 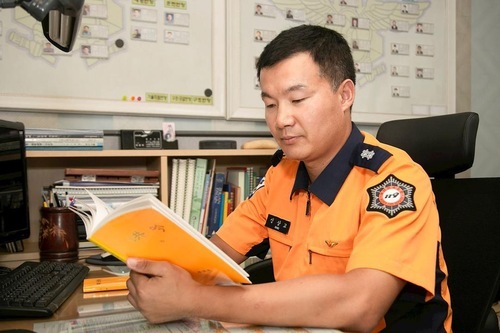 After working as a firefighter for 13 years, Xin said that many things that he encountered, such as major fires that took people’s lives and turned everything to ashes, had a traumatic effect on him. These experiences often led to depression and despair. The benefits also extend to interacting with others, namely becoming more considerate. “The principles of Truthfulness-Compassion-Forbearance taught me to cherish my workers. That means helping them to the best of my ability, without feeling helpless or desperate.” That, according to Xin, is probably the best mindset for a firefighter. Friends said that Xin now has a better temperament and is more cooperative. Compared to quitting smoking and drinking, a bigger change Xin experienced was the improvement of his temperament. “I used to have a bad temper, often getting annoyed and treating others badly,” he explained. “Now my relationships have changed dramatically because I am able to maintain a peaceful mind and I always try to do better on my part.” His friends praise him for being amenable and so caring. Being a fire chief means that Xin needs to get to work earlier than the others to plan the daily routine and get ready. “I’ve discovered that the fire chief’s mindset can affect the attitudes of the entire team of 25 people,” he said. Xin no longer fights for personal gain and often delegates duties to his team members, which motivates the sub-teams, with team leaders working very well with each other. Having experienced these benefits, Xin feels obliged to tell others about it. He often goes to Bucheon Station on weekends, sharing with others about Falun Dafa and the ongoing persecution in China. “For me, Falun Dafa is as important as my own life,” said Xin.